are three dynamic and uniquely talented singers who seamlessly connect to create a classic vocal harmony group. They have quite an impressive list of credits as solo artists - from Broadway to television to recording hit songs. He recently played Curly in Oklahoma! at Arena Stage in Washington, DC for which he received a 2011 Helen Hayes Award for “Best Actor in a Musical” and was named “Top 10 Performers of 2010” by Hilton Als of The New Yorker. He also recently participated in the Sundance Theatre Lab to develop the musical adaptation of Like Water for Chocolate, playing Pedro opposite Chita Rivera, and Lila Downs. Nicholas made his Broadway debut as the title role in Disney’s production of Tarzan. Prior to that, Nicholas originated the role of “Aaron," starring opposite Val Kilmer's "Moses" in the U.S Premiere of The Ten Commandments at the Kodak Theatre in Los Angeles. Nicholas also had the pleasure of playing “Moses” at several performances. Off-Broadway he starred in The Toxic Avenger: The Musical, Almost Heaven: Songs of John Denver, and Bajour. He’s also traveled the world on tours of Jesus Christ Superstar (Jesus), Evita (Che), and Hair (Claude). Nicholas’ Regional Credits include: The Light in the Piazza (Fabrizio) Oklahoma! (Curly), Damn Yankees (Joe Hardy), South Pacific (Joe Cable), The King & I as “Lun Tha” with Lou Diamond Phillips, Nefertiti (Akhenaten), Cinderella (Prince Charming), Last 5 Years, Candide with Harrisburg Opera, Love, Valour, Compassion! (Ramon), Master Class (Tony). Venturing into the world of the web, Nicholas joined the ensemble cast of Then We Got Help for which he received a Best Actor Nomination for the American Soap World Awards, and this fall he is joined the cast of EMPIRE: The Series. When not on stage, Nicholas is proud to be the Artistic Director for the Broadway Dreams Foundation faculty, and volunteers for The Harvey Milk school in New York City, and SMYAL in Washington, DC for which he received the 2011 Outstanding Community Ally Award. was named “Top 10 Performers of 2010” by Hilton Als of The New Yorker. Austin Miller is an American actor, dancer, and vocalist, best known for his long running appearance on the NBC televised competition, "Grease: You're the One that I Want! ", playing Link Larkin in multiple productions of "Hairspray", as well as playing the role of "Hawk" on Days of Our Lives. Miller studied dance in Houston, Texas under the direction of Patsy Swayze and later attended Texas's Baylor University on a vocal scholarship, but was soon heading west to star in the Las Vegas production of "Enter the Night," and continuing on to Andrew Lloyd Webber's "Starlight Express". Six foot tall Miller then went on the road with the national tours of "Grease" (Kenickie), Smokey Joe's Cafe (Michael) and Victor/Victoria. After leaving the stage for his role in "Days of our Lives", he quickly returned as Link Larkin in the musical "Hairspray" originating the role in both the first national tour as well as the Las Vegas original cast. In 2007, he joined the NBC televised competition "Grease: You're the One that I Want! ", where after an eight week run, he placed second with less than a 1% difference in votes. Since Grease, Austin has starred in the pre-Broadway run of "Trip of Love", and NYMF's Jerusalem Syndrome, as well as the symphony series "Elvis-from Broadway to Memphis". He also played Billy Lawlor in Goodspeed's production of "42nd Street" as well as the subsequent national tour. Several stage appearances have followed, including starring as "Joseph" in Andrew Lloyd Weber's "Joseph and the Amazing Technicolor Dreamcoat" in multiple venues, DC's Arena Stage's award winning production of "Sophisticated Ladies" with Maurice Hines, and starring as Joe Hardy in "Damn Yankees" with Andre De Sheilds. Branching into more creative areas, Austin most recently had an original screenplay picked up at Rocklin/Faust, a feature production company in Los Angeles associated with Alcon Entertainment and Warner Brothers Films. was called “the future of musical theater” by The Los Angeles Times. A classical violinist since the age of five, Connor studied opera at the Eastman School of Music in New York (U. S. News and World Report ranked #1 Music Conservatory in America 2010, 2012), and has since toured the globe as a professional performer. Notable theater performances have included leading roles in Miss Saigon (Chris) Sweeney Todd (Anthony) The Last Five Years (Jamie) Little Shop of Horrors (Orin, “The Dentist”) Joseph and The Amazing Technicolor Dreamcoat (Joseph) Forever Plaid (Sparky), as well as Altar Boyz (Abraham). Connor has been a featured soloist with the Detroit Symphony Orchestra, The Rochester Philharmonic, The Akron Symphony, The Cleveland Pops, and the Cleveland Orchestra. He was also a finalist on the first season of ABC/MTV’s “Making The Band,” starred on an episode of the History Channel's "Shifting Gears", and has served as executive music supervisor/composer to the Discovery Channel for their series, "The Kustomizer". As a songwriter, several of his original songs have been featured on national television, including ABC's "Days of Our Lives" and MTV's, "The Hills". In the summer of 2001 "Inside Out", the lead single from his eponymously titled first album, vaulted to the number one radio position in France, and held the position for several weeks. He has since toured the U.S to support his three full-length pop/rock albums, and along with his band, has performed as the opening act on over 20 national tours, including Ashlee Simpson, Huey Lewis and The News, Edwin McCain, Richard Marx, Rick Springfield, Hall & Oates, and Mariah Carey. was referred to as an vocalist "who sounds as authentic singing Guns N' Roses as he does Puccini." by GQ Magazine. As The Matinee Idols, they remold and update traditional film and Broadway material to produce a new and glorious sound. But they are not limited to the traditional. They also bring a fresh approach to baby boomer pop and even current top 40 material. Their show is an uplifting, soul stirring, heart-stopping wonder. 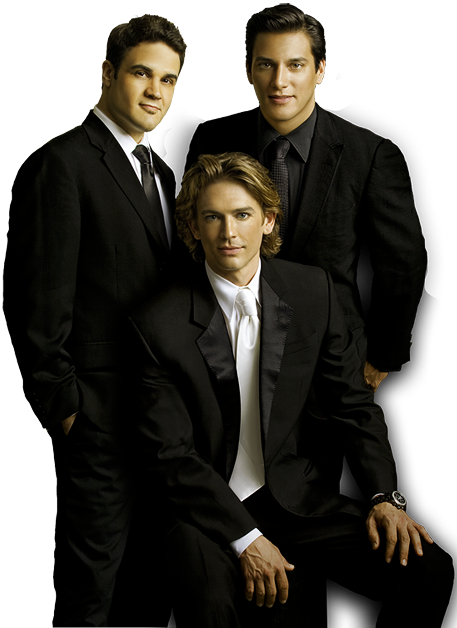 Three stunning young men, a bucket of talent, limitless charm and a boatload of divine music – it doesn’t get any better.